The City of Winnipeg is teaming up with a social enterprise recycling group to keep mattresses out of the landfill. There are hopes a new City of Winnipeg collaboration with a social enterprise will help curb the familiar sight of matresses in the city's back lanes — and keep more mattresses out of landfills. A pilot program between the city and Mother Earth Recycling will collect up to 8,000 mattresses and box springs to be recycled, the city said in a news release Wednesday. The city will contribute $193,000 to the pilot, which will accept drop-offs for free at the Brady 4R Winnipeg Depot at 1777 Brady Rd. until Jan. 31, 2020. Mother Earth Recycling, a Winnipeg-based Indigenous-owned social enterprise and the city's only mattress recycling service, will take them apart. Fabric, foam, metal and wood components will be separated and recycled. Foam from mattresses can be turned into carpet underlay, for example, metal from box springs into cans and wood into craft materials or firewood, according to Mother Earth's website. "This pilot project not only benefits the environment, but it also creates social and economic prosperity and stability for our community," said Jessica Floresco, Mother Earth's general manager, in the city's written release. The program won't accept mattresses that are wet, soiled, burnt, mouldy, or infested with bedbugs. Air mattresses, waterbeds, bed frames and sofa bed frames won't be accepted either. Coun. Cindy Gilroy (Daniel McIntyre) said in the release waste diversion is part of the city's plan to battle climate change and extend the life of the Brady depot. "We are excited to find a partner in Mother Earth Recycling that will help us pilot this program, and do so in a way that provides meaningful employment and training opportunities in the Indigenous community," she said. 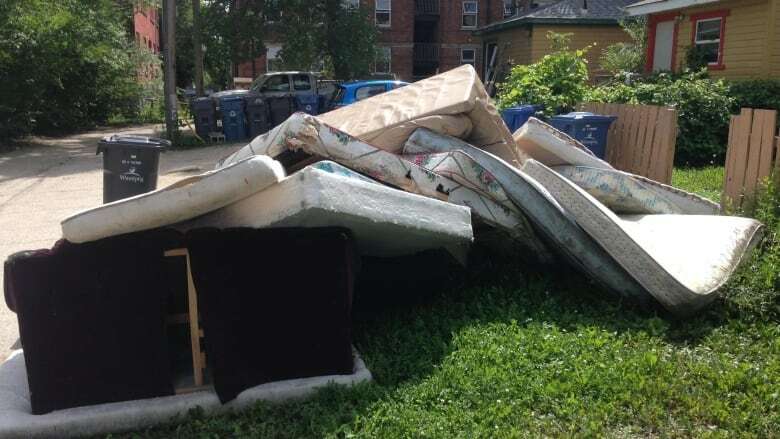 Avrom Charach, spokesperson for Winnipeg's Professional Property Managers Association, said discarded mattresses can be a fire hazard and a headache in the city. His own mid-sized property management company deals with 300 to 500 abandoned mattresses per year — and he's not sure they all come from tenants. "We also end up paying a lot of money to have things picked up that have been dumped beside our buildings by people who don't even live in our buildings," Charach said. "Mattresses is part of it — sofas, chairs, all sorts of things. We have 21 apartment buildings in our portfolio and I would venture to guess that at least twice a month we're calling for pickup of items that we know didn't come from tenants at our buildings." Charach is hoping the new program will cut that work down. "A lot of responsible homeowners will strap a mattress onto their car and take it to Brady landfill. They'll do that rather than paying pickup fees and they'll also do that rather than dumping it, hopefully, on someone else's front yard," he said. He guessed the city's property management companies alone could hit the program's cap of 8,000 mattress and box springs, so his advice to mattress-owners is to act fast. "Don't wait, and please don't dump it on a property manager's property," he said, laughing. "Please take it to the recycling depot so we don't have to deal with it."